What are you doing Wednesday night? 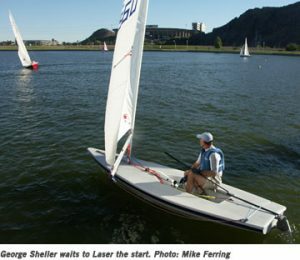 How about coming out for some highly casual racing at Tempe Town Lake? We start racing at 5:30 and go until sundown. We do a one minute sequence. I have a whistle and signal: 5 short blasts is “AP down,” followed by a 10 second gap, then one long as the start of the one-minute countdown. I try to give 3 shorts at 30 seconds, 2 at 20, 1 at 10 and then one long for the start. A single 360 turn clears penalties. We set short courses, so we’ve gotten up to seven races in. If the Ferrings are there, we use their automated starting gadget. This started as a Laser thing, but others started coming out, which was great. We all start together. This is not an official AYC event, so you’re on your own in terms of a boat, liability and fun. We start promptly at 5:30 pm and if you miss one or two races it’s no big deal since we don’t keep scores. This is good practice, with bragging rights and then (for those who want to) off to a local restaurant for dinner and drinks. June Monthly Meeting: Extreme Sailing!